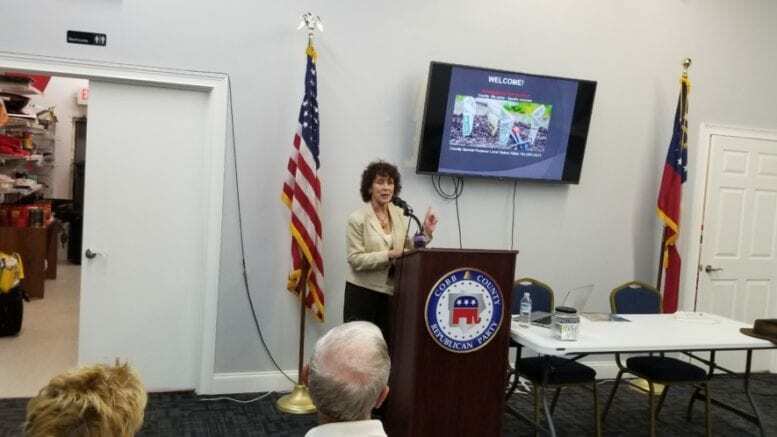 A citizens group that has criticized the spending and accounting practices of the county’s Special Local Option Sales Tax (SPLOST) held a town hall meeting in the Cobb County Republican Party headquarters in Marietta Tuesday night. The speakers were activists Jan Barton, Debbie Fisher, and Larry Savage. Barton told the Courier that the group had not formally chosen a name, but had used the name “Citizens for Accountability” informally. She said the SPLOST was supposed to be a temporary and special project tax. “Government is supposed to limit SPLOST spending to valid voter-approved projects,” she said. She said potholes on all major Cobb roads is an indication there is no value to the SPLOST. “Or maybe it all went to sidewalks to nowhere,” she said. Barton said that increases in revenue to the county makes proper reporting even more important now. She said her group had spent about two years meeting with county officials and staff, and had not gotten a favorable response. The group hired former Georgia Senator Josh McKoon, and send a notice to the county of their intent to file an ad litem action against the county. She said the next step of the group is to get public support in order to avoid filing an expensive lawsuit. She said if SPLOST didn’t exist there would be more accountability because when the BOC creates a budget they have to account for every dollar, but, she said, that isn’t what happens with SPLOST. She said that the revenue from the three SPLOSTs amount to $2.2 billion, with very little oversight. The options the citizen’s group have considered include requesting a grand jury or filing a lawsuit. She said it was unlikely the district attorney would take SPLOST spending to a grand jury and that a lawsuit would be expensive, so for now the group is appealing to “the court of public opinion” for support. She said the group had sent two letters to the county attorney and Mike Boyce with their complaints about the use of SPLOST funds, and that the county denied any wrong-doing. The group was particularly critical of the Bob Callan Trail, which Fisher called “the Taj Mahal of all trails.” She questioned the removal of the trail from the capital projects fund and its inclusion in the SPLOST. She said a segment of the trail was added to the 2005 SPLOST at the end of last year. Fisher said funds were comingled between SPLOSTS, and between county and city projects. Please accept this correspondence in further response to your notice to Chairman Boyce of citizens allegations against Cobb County for alleged failures to provide proper accounting for SPLOST revenues raised. Based upon our review of those claims, we have concluded that Cobb County properly funded the projects identified in your correspondence with SPLOST funds because they were sufficiently identified SPLOST projects and that mandatory reporting required by the Georgia law has been satisfied. Each of the projects was specifically identified or fit within a category approved by the electorate for each SPLOST. Thereafter, the approval for funding for each project was voted on in a public meeting by the Board of Commissioners after the funding request was submitted by staff to the Board of Commissioners for approval. The county Finance Department prepares multiple SPLOST financial reports, including those required by statute, as well as those that may be requested by departments or the citizen oversight committee. Many have been provided to your identified clients. One required report is published in the newspaper each year. 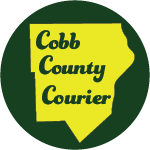 4 Comments on "Group critical of Cobb SPLOST spending holds town hall"
Just a bunch of hot air from a group that’s opposed to any taxes and development in the county. SPLOST is a fairly well understood process and the county is in compliance with the requirements. The State AG has confirmed this for them already as well. I actually dislike SPLOST. We should drop this and raise the property tax in a progressive manor so that a $500,000 McMansion pays a higher millage rate than someone in their modest home does. The idea of a progressive millage rate is interesting, but I’m not sure how politically feasible it would be. Do you know of any place it’s been tried? Ralph Miller, It seems you are a bit short on facts. We are NOT opposed to all taxes nor are we opposed to ALL development. What we are opposed to is irresponsible spending of our tax dollars and we want the County to follow the law. We clearly stated in our town hall that we neither support or oppose SPLOST. We have become addicted to SPLOST which has lost it’s original intent of SPECIAL PURPOSE projects. They are still spending money out of 2005 SPLOST. 14 years after the fact…You ok with that? We currently have 3 SPLOSTs we are spending from worth $2.2B and that doesn’t include the overage of $69 M in the 2016 SPLOST. If the county would have closed 2005 they had $25M available that could have paid down debt and / or lowered the millage rather than raise it by 1.7 Mils. Ralph. Your childish name calling “hot air” comment is completely off the mark. If you had listened more carefully to the details, yes details of, and supporting documents for the allegations made by the SPLOST Group you would have all you need to understand the validity of said allegations. Learn more to be adequately informed! Yes, although “SPLOST is a fairly well understood process,” it appears that the process is not sufficiently well understood by the COBB BOC. Since it is OUR money that the BOC are spending, full SPLOST accountability is required by the tax paying citizens of Cobb County.